I've been wanting to make these chain hair tie bracelets from I Spy DIY ever since I saw them and I finally got around to it last week. You guys. This was so easy. Ridiculously easy. I've never been much for making my own jewelry, except for embroidery floss friendship bracelets in elementary school, but maybe I need to rethink my choices. I made mine slightly different than Jenni, as she is using hers for her hair, while I want mine to be just bracelets. Note: I purchased my chain from Jo-Ann Fabric. If you're thinking you can get small chain at Home Depot, don't even try it. All of their chain is ginormous and industrial strength. Chain from the jewelry section of a craft store is the way to go! - Create a small length of chain (about half the circumference of your wrist) using your pliers or fingers. My chain was super easy to open and close with my fingers. - Open the chain link at the end and insert your hair tie. Close the link. - Put two jump rings over your hair tie. Open the link at the other end of the chain and insert the other end of the hair tie. Close the link. Try to make sure that your chain is flat when you're doing this. If it gets twisted, just reopen one of the links and straigten it out. - Use your pliers to tighten the jump rings at the end of each hair tie, close to the chain. This will help keep the sides of the hair tie together. See?! How easy was that?! This project was also super cheap and customizable. I didn't buy any hair ties, as I already have an arsenal of black ones on hand. But hair ties are inexpensive and come in tons of colors. There are also a lot of options when it comes to color and style of chain. Really - the possibilities are endless! Total cost for chain + jump rings = $7.57. So far I've made 7 bracelets and I have enough chain left to make about 10-11 more. So $0.42 per bracelet ain't too shabby if you ask me! Any recipe involving black beans, rice, and cheese is definitely a keeper in the Surznick kitchen and this Chicken and Black Bean Casserole from Six Sisters' Stuff is no exception. We've made this recipe numerous times now, but this past time we decided to switch things up a bit to make a meatless version with chipotle salsa! - Preheat oven to 350 degrees and lightly grease a glass pie dish. - Cook your rice in the vegetable broth, according to package directions. - Heat olive oil in a skillet over medium heat and cook onion and zucchini until onion is tender and zucchini is slightly browned. Season with your spices. - In a large bowl, mix together onion, zucchini, black beans, chipotle salsa, and 1 cup of cheese. Transfer into your pie dish and sprinkle with remaining 1/4 cup of cheese. - Cover dish with aluminum foil and bake for 20 minutes. Uncover and bake an additional 10 minutes until casserole is bubbly and lightly browned. You can serve this as is or top with a little plain Greek yogurt or sour cream! I like the touch of spiciness that the chipotle salsa adds. We decided to eat our leftovers in tortilla shells which was super delicious as well! This recipe was the perfect size for two meals for each of us, but I love that it can easily be doubled if you're serving a larger group of people. Think you'll make this for your friends and family soon? Instagram is my favorite app. Not only do I love getting to see awesome photos from the people I follow, but I love getting to share a glimpse into my life with my followers too. My Instagram account is kind of like a little yearbook of all the fun, exciting things Nick and I get to do, as well as our everyday life mixed in. Since I love these photos so much, I've wanted to incorporate some into our home decor and I thought that refrigerator magnets would be a great way to share some of our favorite snaps! There are plenty of companies out there that will turn your Instagram photos into magnets for you, but why buy when you can DIY?! Note: We bought a sheet of 36 2x2" tiles from Home Depot for about $2. They were attached with a small amount of glue and can easily be separated into single tiles. The only single 2x2" tiles we found came in packs of 4 for about the same price, so the sheet of 36 is the way to go! 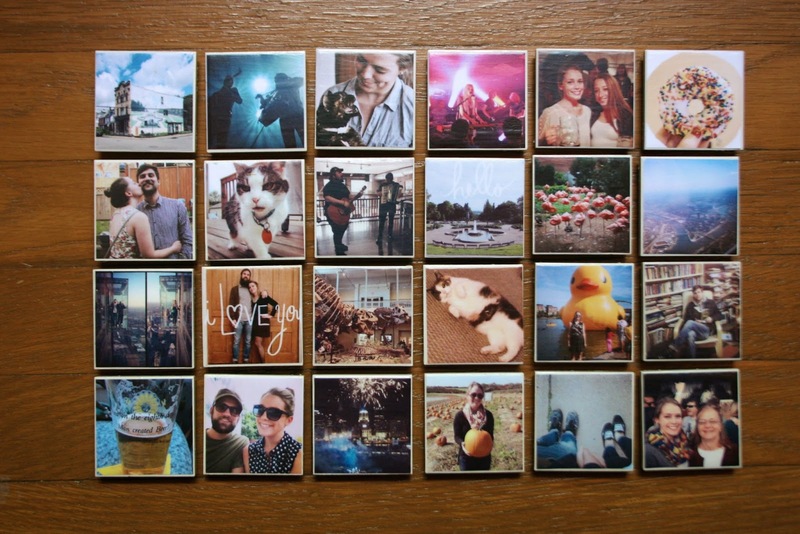 - Compile the photos you want to use for your magnets (trust me, narrowing them down is the hardest part). You can view your Instagram account on your computer at Instagram.com/YourUsername. I took screenshots of mine from the website into our photo editing software and cropped/made other changes. - Next, I copied all of the photos into a Word document and resized them to have 1.81" sides. This will give a very small border on the photos so that the paper isn't going to the very edge of the tile. I put 2 spaces in between each photo to make room for cutting. I was able to fit my 36 photos onto two sheets of paper. - Print your photos. (We got ours printed at Staples for $1.25 - we were out of colored ink at home.) Cut out your photos. - If necessary, separate and clean the glue off your tiles. Nick used an Xacto knife to cut them apart and scrape off any remaining glue. - Apply a coat of Mod Podge and place your photo on the tile. Press down and smooth out the edges. - Apply a coat of Mod Podge on top of the photo. After it dries, add a second coat. - After your tiles are completely dried, flip them over and glue a magnet to the center of the back of the tile. - After the glue is dry, your magnets are fridge-ready! If you make your own Instagram magnets, be sure to let us know in the comments!